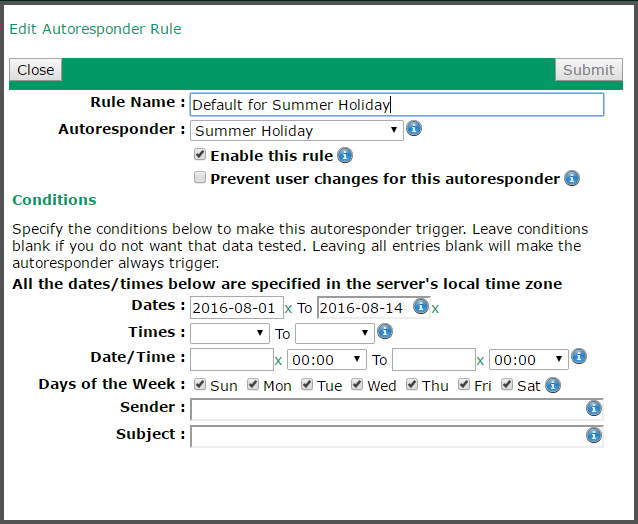 This window lets you define an Autoresponder Rule for a user. To get here edit a user, go to the Autoresponder tab and add or edit an Autoresponder Rule. The Autoresponder Rule definition tells VPOP3 when to use an autoresponder. To define what VPOP3 should do, see Autoresponder Definition settings. VPOP3 processes the list of Autoresponder Rules in order from top to bottom and stops when it finds a matching rule, so you can use Rules to prevent other autoresponders from being triggered. You can alter the order of the Rules on the main Autoresponder tab. The Rule Name is a name you specify for the rule. It can be anything, but we suggest something meaningful so it will help you maintain the settings. 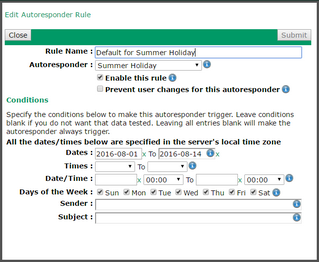 The Autoresponder option sets the Autoresponder definition which will be used when this rule is triggered. You can choose <None> here so that no autoresponder is triggered when the rule matches. This can be useful to set exceptions to other autoresponders. The Enable this rule box lets you easily enable or disable this rule without having to totally remove it. The Prevent user changes for this autoresponder means that the user cannot change the rule from their Webmail settings. The Conditions section sets which conditions need to match for the Autoresponder Rule to be triggered. Any conditions which are left blank will not be checked and will be deemed to always match. So, if you create a rule and just leave all the conditions blank/as default, then the Autoresponder Rule will match any incoming message. The Dates settings tell VPOP3 between which dates the Rule should be triggered. The dates are inclusive and start/end at midnight. The dates are shown in YYYY-MM-DD format. So, 2016-08-01 to 2016-08-14 means that the Rule will be triggered from 00:00 on 1st August 2016 until 24:00 on 14th August 2016 (or 00:00 on 15th August 2016). The Times settings tell VPOP3 between which times the Rule should be triggered. The times are inclusive and are in 24 hour format. You can select times in 15 minute segments. So 8:15 to 14:45 means that the Rule will be triggered from 8:15 am until 2:45 pm each day. The Date/Time settings tell VPOP3 between which dates & times the Rule should be triggered. The dates are inclusive. The dates are shown in YYYY-MM-DD format. So, 2016-08-01 8:15 to 2016-08-14 14:45 means that the Rule will be triggered from 8:15 am on 1st August 2016 until 2:45 pm on 14th August 2016. Note that using the Dates and Times settings together is different from using the Date/Time settings. The Days of the Week settings specify which days of the week you want the Rule to be triggered. For instance, you could use this to have a different rule to be triggered on week days from at weekends. The Sender setting lets you specify the sender email address which has to match to trigger this Rule. You can use wildcards and regular expressions (by surrounding the text with / characters). For instance, you could use something like *@my.local.domain to create a rule specific to local mail so that this triggers a different autoresponder or prevents an autoresponse at all (using <None> in the Autoresponder setting). The Subject setting lets you specify the subject line which has to match to trigger this Rule. You can use wildcards and regular expressions (by surrounding the text with / characters).